THIS TRIP HAS SOLD OUT FOR 2019. Last fall I travelled the furthest North I’d ever been, documenting the pristine wilderness of Svalbard for the first time. Experiencing some of the most unique glacial mountains and resilient wildlife I’d ever seen, my connection to this Arctic landscape has grown strong. This year, I’m preparing for one of my biggest trips in the Arctic to date, travelling by ship to the Northern coast of Svalbard. I’m thrilled to announce that you could have the opportunity to join me on board. Alongside a great group of photographers and guides, I have secured four of my own places on the ship for you be a part of this experience. With photographers in mind, I will work directly with my team of four throughout the trip to refine your creative eye and visual style. Covering everything from compositional techniques to in-depth editing processes, I will help you to hone your photographic aesthetic and assist you in telling your own photographic story of the Arctic. We will shoot together amidst one of the most remote areas of Svalbard, only reachable by ship, home not only to some of the most magnificent outlet glaciers on the planet, but also to one of the worlds most pristine Arctic wildlife areas. It’s going to be a true photographic adventure. THE LAND OF THE POLAR BEAR. This expedition will be carried out on a ship over ten nights, focused purely on photography and the experience of being completely disconnected. We’ll be starting out and ending in Longyearbyen, where we will board the ship and unite with a small group of other photographers as well as my great friends and fellow guides Hannes Becker, Lina Kayser and our expedition leader Michael Ginzburg. 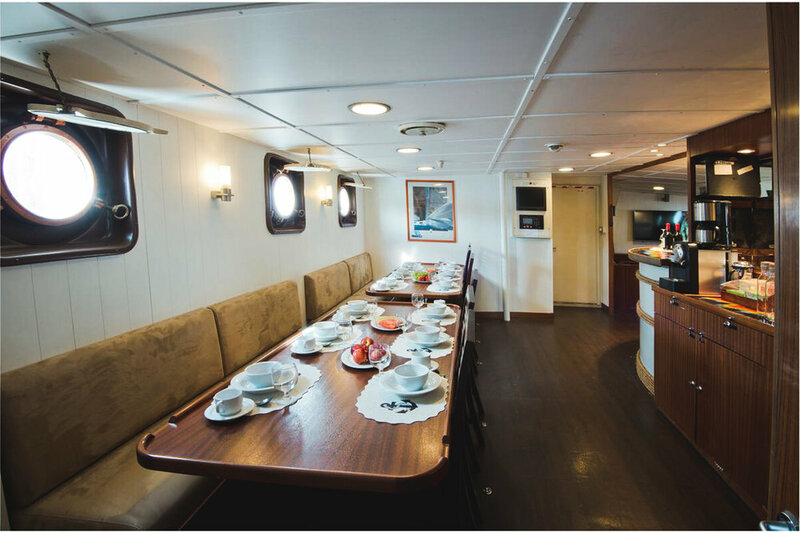 We will be travelling aboard the ship M/V Kinfish, with a maximum of 12 guests on board. 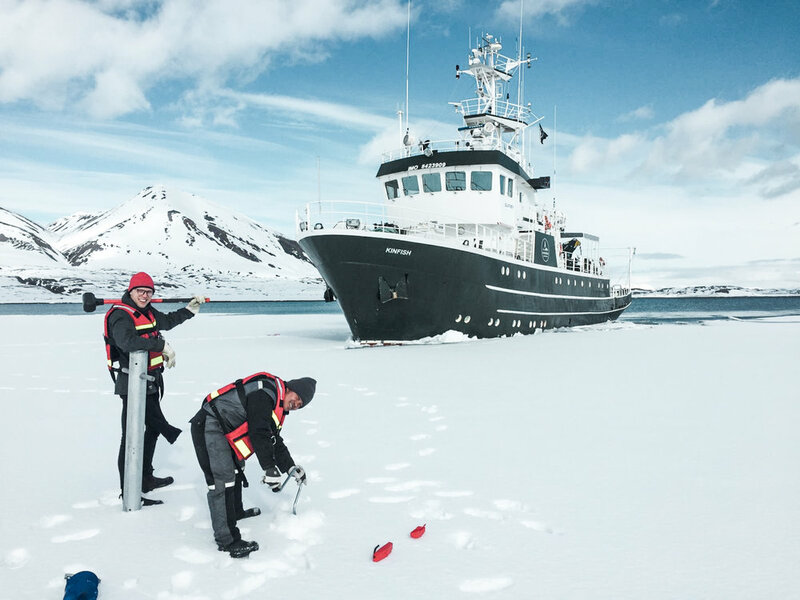 With the small total group size, this ship was selected to keep our experience intimate and fully embrace the peacefulness of the spring season in Svalbard. Travelling between late April and early May gives us the opportunity to photograph Polar Bears and their cubs. At this time of year, the mother bears will bring their cubs out on the sea ice to find food. As it is the spring season, there’s usually ice left in the fjords and around the mainland, so we will be able to follow the ice as it slowly drifts North. The chances for seeing them from the ship should be really good, and it’s great way to photograph them without any disturbance - something that is extremely important for us. The ship has a spacious deck at a low level that will allow for us to achieve some really amazing shots. Polar Bear Safety - We are guests in the home of the polar bear and will act respectfully to ensure that they are undisturbed by our presence. The safety of our guests and not least the safety of the polar bear will always be top priority. Our expedition leaders are experienced and certified guides, with extended knowledge on polar expeditions. Though extremely rare, they have the skills and training on how to safely handle any potential situation that could arise. We will welcome you on board the ship at Longyearbyen harbour at 4 pm. Get settled in your cabin, and get to know your expedition team and fellow explorers. You will wake up at harbour in Longyearbyen and disembark at around 08:00 am. Benjamin is an Australian freelance photographer based in the South of Iceland. With a strong focus on the Arctic region, Benjamin's work reflects the lifestyle and intense seasonal shifts seen across the landscape in this part of the world. 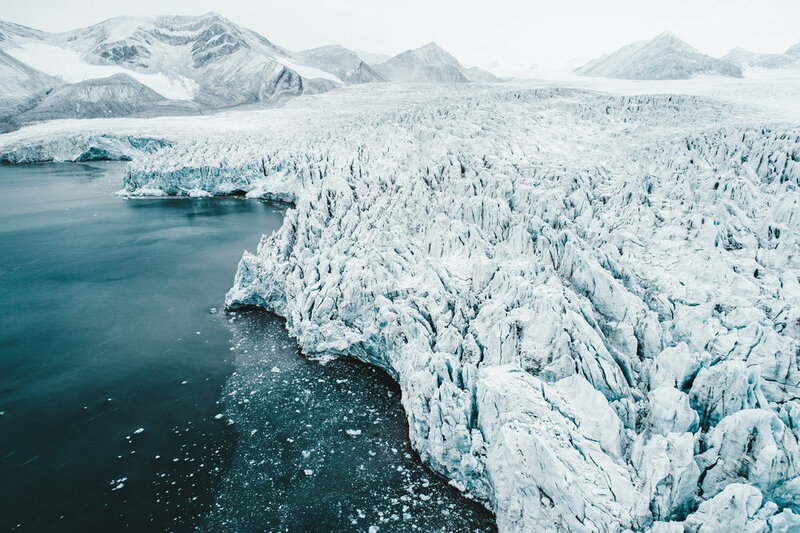 After years of photographic exploration throughout the mountains of Iceland, Benjamin now travels regularly into the high-Arctic, working to create a unified visual story of the freezing North through photography. Anyone is welcome on this expedition, wether you are a beginner, enthusiast or pro. If you are a passionate beginner we will help you with the technical skills, and for the pros we will do our best to get you the shots you have dreamed of. A DSLR or Mirrorless camera body and lenses of your choice. The best combination is to bring both a wide angle and a tele lens, or a zoom lens like 80-400 mm. A sturdy tripod is useful for heavy lenses and bring your laptop and external hard drives for editing sessions. Keep in mind that the climate in the Arctic can be very harsh with strong winds, cold temperatures, snow and ice. Extra batteries is crucial. We will also have a variety of camera gear on board that you can try out and loan. In the Arctic you need to be prepared for anything. Temperatures down to -20°C / -4°F can be expected, and in combination with strong winds and snowfall it is going to get cold. We will spend quite amount of time outside on deck photographing and looking for wildlife. Make sure you pack to stay warm. Will we see any wild animals? The chances are very high that we will see wildlife, but with wild animals no guarantees can ever be given. The expedition team are experts in their fields and will know where to go for the best opportunities. Animals that we can expect to encounter is the polar bear, arctic fox, walruses, reindeer, seals, whales and arctic birds. We will do zodiac excursions and landings on shore, and if conditions allow we will do some hiking. The main purpose for the hikes will be getting to awesome photo locations and viewpoints. There will also be editing sessions on board the ship in-between the shootings. There are daily flights from Oslo to Longyearbyen and flying time is less than 3 hours. Be aware of the mandatory ID control for all travellers, also Norwegains, so don't forget to bring your passport or national ID card. Feel free to contact me if you have any additional questions!